Somewhere around Longview, Alberta, Ian Tyson, age 70, is living his dream. He’s got a loving wife and daughter, a barn full of quality horses, and green grass as far as he can see. But in his heart, he knows his dream can’t last. Calgary, one of the fastest growing cities in North America, is about an hour’s drive north and Ian senses the city envying his land and his dream. He knows there is no happy ending to this song. Twenty-five years ago, Ian and Twylla Tyson could count eight yard lights along the road to their ranch. Now, he says, the big ranches are being broken up, subdivided, and you’d need a digital counter to keep track of the acreages and ranchettes that have replaced them. As the urban demands of Calgary and Okotoks, the bedroom community just south of Calgary, close in on his ranch, Ian cannot avoid sensing the inevitability of what is to come. It is a hard reality for Ian, and in a very personal way, a sadness for him. 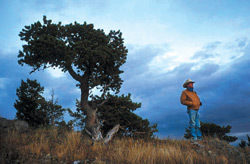 Here, on his ranch surrounded by grass, horses and family, he has lived the life that inspired hundreds of songs about ranching and cowboying – songs that have earned him dozens of music industry awards and made him a Canadian cultural icon with the 2003 Governor General’s Performance Arts Award. And now he sees that life slipping away, forcing changes onto him that he resents but cannot avoid. He locks his doors when he leaves, he can’t have a sign on his gate, he screens his phone calls, and he doesn’t let his ranch be photographed. By nature, he’s an extrovert, an entertainer who, through his music, has kept the wide expanse of range alive in the imagination of two generations. And now he’s being backed into an urban corral. To protect himself and his family, he’s put up a fence of privacy around his life and he’s cautious about who he lets in. In agreeing to be interviewed for this story, he asks that Judy and I respect and protect his privacy. That’s why we have chosen photographic portraits of Ian, supplemented with watercolours that hint at the beauty and simple elegance of the Tyson Ranch. And so, for half an hour, he opens his door to us, as strangers, and welcomes us into his home and life. He doesn’t know us, and all we know about him could be learned by anyone listening to his CDs. The interview process began a week earlier with a phone call to his ranch. We talked a bit about doing a story on the future of the ranching life, and he said he would think on it. What he really meant was he would be checking me out before he committed to anything. A few days later Canadian Cowboy Country sent him a package of back issues with my stories and Judy’s artwork, and a copy of my novel, The Story of Blue Eye. Then I called again and I heard a smile in his voice. He had looked through the back issues and was reading about Blue Eye. We talked some more about the history of western North America, the Plains Indian Horse Culture, and, finally, the future of ranching. Unexpectedly, he quoted a very accurate, but little known historical account of the arrival of the first horses into the Canadian plains. Caught unaware, I commented on his knowledge. He laughed in response. “I’m not just a pretty face,” he said. In his laugh I heard not only his humour but also his awareness that he knew he had caught me by surprise. We talked a bit more about ranching, and again he caught me by surprise. “And do you see a happy ending to it?” he asked. That was the moment I knew there was more to Ian Tyson than just a singing cowboy selling home on the range. He lived in reality, and I knew he had a story to tell. But before we could set a time for an interview, he had a performance in Missouri. We would talk again when he got back. It was hard to stay patient, but he wouldn’t be rushed. Then, on a Monday morning, he gave me directions to his ranch. I told him I would bring Judy who was interested in material for her watercolours. No problem, he said. He had some horses to work in the morning, he added, so we should be there around 5:30. He’d be done his afternoon chores by then. We shake hands, politely, and he says to wait on the porch while he finishes his chores. We offer to help. No, thanks, he answers. “It’d take longer to tell you what to do than do it myself.” Gruff. Checking us out, telling us he’s in charge. He is big body language. His eyes, grey blue, don’t fool around. They run straight at you. His limp, he tells us later, is from a horse wreck, but he’s getting over it. We wait on the porch, then wander over to the corrals where two bays sniff at us between the rails. Everything neat, tidy and safe. 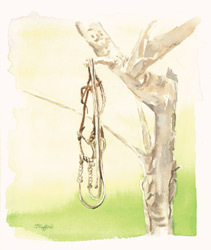 Old bits, spurs, and braiding hang on posts here and there. Judy looks them over, admiring the quiet artistry of the displays. She’s thinking about a painting. Ian returns to the house, we exchange only a few words before he goes straight to the point. “What are we going to do?” he asks, his arms folded over his chest. His face is impassive, revealing nothing, telling me it is my job to convince him, or leave. I note his ‘don’t fool with me’ shoulders, square, high and broad. I explain to him that I want his views on the future of ranching. I want to tell it straight, I don’t want to write a personality piece to amuse readers with anecdotes about his career and quirks. He likes that and he settles into a chair, letting me know he has accepted the deal. Then, as if we had passed through the last portal into his world, Ian relaxes. Chandler, a long-haired tabby housecat, winds through his legs. With a gentle hand he strokes the cat, playing his fingers along its back as if it were a guitar. And for thirty minutes Ian talks. And as he talks I come to know how hard he has worked in his lifetime to produce those easy-sounding lyrics. He has studied life in a way no romantically-inspired balladeer of the west has ever studied. He’s no country singer living the best part of his life on a stage. He reveals what he really is – a historian, a philosopher, and an anthropologist. With an absolutely stunning display of intellectual diversity he quotes off-the-cuff details from academic classics such as John C. Ewers’ The Horse in Blackfoot Indian Culture, Leroy Kelly’s The Range Men and David Lavender’s Bent’s Fort, and follows the evolution of cultures through Jane Jacob’s thought-provoking 2004 book Dark Age Ahead. And he not only knows the books – he owns them, physically and mentally. Later he shows me his library; long shelves of literary, art and historical works. And an abundance of Larry McMurtry and Cormack McCarthy. As he hands me books, they open on their own, often where a plane ticket has been tucked between the pages. His curiosity must be relentless. marriages, and a comparison of land ownership in Canada and the USA. He knows his stuff. But he knows it more than just academically. He knows it artistically, as if he can sense in his heart what others have to be convinced of by science. Research, I suspect, only confirms what his instincts tell him. In one sentence, he reveals how easily he can translate academic knowledge of the origin of the western mythology into lines an audience can relate to today. 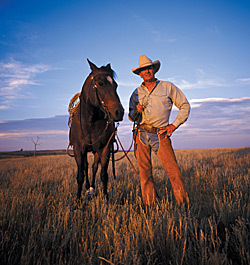 He backs up his predictions for the sad future of ranching as it is known today with practical knowledge of water levels, grazing capacities, steroids and hormones, ranching equipment, and droughts. He discusses feedlot economics, the advantages and disadvantages of small cow-calf operations, and the current big ranch dilemma. “The old ranchers are land rich and cash broke all the time,” he says, succinctly explaining why they can be persuaded to sell their land to developers. Ian pauses, talks a few minutes about the few pockets of big, open spaces that still remain in western North America – Nevada, the Nicola Valley – and are under constant pressure. He winds his views into an ever-growing ball, as if western history were a long piece of yarn, with the trailing end being the inevitable demise of the ranching era in Western Canada. “It’s the last go-round,” he concludes. “And is there hope?” I ask, not liking the way the curtain is coming down. Ian adjusts himself a little in his chair. He answers without much enthusiasm. Lately he’s seen a few wealthy city men come into the country and buy up big parcels. So maybe they will keep things going a while longer. Maybe. It’s not much. He pauses again, watching the two bays swishing their tails and chewing on wisps of hay. He thinks. His solitude surrounds him. He is carefully choosing his words. The interview ends. Putting away the notepad is a formality that Ian recognizes. We’re sticking to our deal. Now it’s just Judy, Ian and I talking about life. He takes us to his studio, poses for a few pictures, points out the nests of Horned owls and Swainson’s hawks in the poplars, and the grove where the ‘Mulies’ gather in the dusk. Land. He loves it and all that grows and lives upon it. 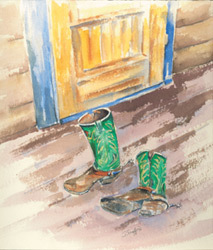 Tyler and Judy Trafford live in Calgary and Cowley, Alberta and are regular contributors to Canadian Cowboy Country Magazine. Tyler’s first novel, The Story of Blue Eye, Book One in the Sun On The Mountains series (published by Thistledown Press), takes place in the Rocky Mountain Foothills and Grasslands during the 1800s. 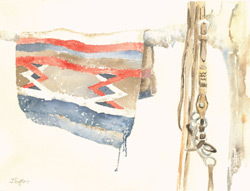 Judy paints and exhibits watercolours from scenes throughout Western Canada.